So said a new, corporate client in a recent kickoff meeting. “Is that how we should continue using those dollars?” he asked. 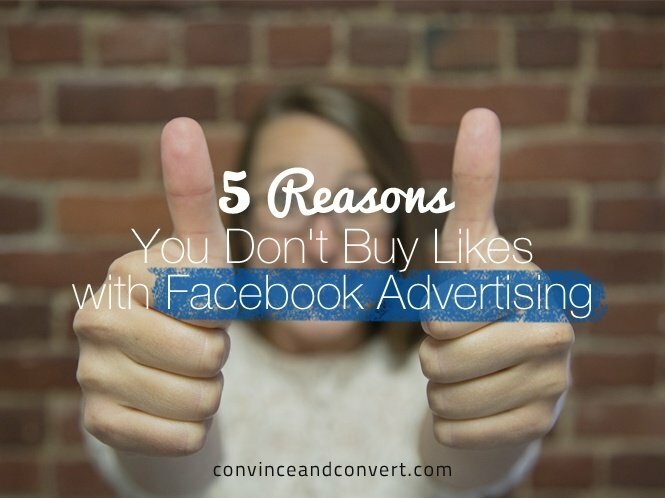 My short answer was “No.” My medium answer was “Hell, no.” Here’s my longer answer, and the 5 reasons you shouldn’t use Facebook ads to drive new page Likes. 1. 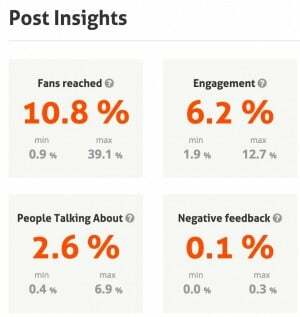 Ultimately, you want your Facebook audience to click on something right? You want them to visit your website, buy something, fill out a form that gives you access to more important data (like email address). You care about actions, not eyeballs. 2. Since the end game is actions, your reach – the overall potential audience you have on Facebook – is far less important than the number of people you can convince to click. 3. If you have more Likes, you have more potential people who might click down the road, but most of them will not. According to Agorapulse and their excellent, real-time barometer of Facebook results the average reach of an organic Facebook post for pages with 10,000-50,000 Likes is 10.8% (as of July, 2015). This means that if you pay 50 cents for a Facebook ad that gets you a new Like (a reasonable cost range for most advertisers), and just one out of ten fans see any particular post, your actual costs to get on that person’s radar are far higher than 50 cents. Imagine if you paid $500 for an ad in a newspaper that reached 1,000 people. BUT, the newspaper was only delivered to 100 people, not the entire 1,000. That’s how the Facebook news feed works. And given that the average click-through-rate on an organic post is .68% (rough estimate, via Quora) it is tough to reliably generate a lot of clicks through your news feed. Summary: you are spending 50 cents each to “acquire” someone that is unlikely to do what you need them to do. 4. It’s inexpensive to generate website clicks with Facebook ads. According to the superlative study from Salesforce.com on social media ad results (Salesforce is a sponsor of my Social Pros podcast), the average cost-per-click on Facebook ads in Q1 2015 was 39 cents. You can spend 39 cents to get a click and then AFTER THE CLICK ask the person to Like your page. They are probably more apt to Like you at that point anyway, after seeing what you’ve given them behind the click. You can spend 50 cents to get the Like via a Facebook ad, and then hope that your new online pal is one of the .68% of your fans that click a link in your organic post. Remember: clicks first, fans second. Turn your Facebook advertising approach upside-down for maximum results.